Today we will visit the interior of a Mexican residence where we can fully enjoy the comfort that overflows into each image. The professionals in charge of the design and interior decoration of this project was Victoria Plasencia Interiors, who clearly has a good eye and the necessary knowledge to realise the ideas of their customers and create beautiful and pleasant room. As we can see in the images to follow, this house hosts a series of welcoming environments, all of which are elegant without losing their sense of home and carefree atmosphere. It is a house full of life and comfort. The design and construction of the house was the work of Arturo Gonzalez, architect, and we can enjoy the photographs of Jorge Silva, who perfectly encapsulated the essence of the home. We invite you to come with us to explore every corner of this house, you will surely love it! We begin with a view of the main facade, which is very discreet and almost entirely private, it shows us very little about the inner beauty of the home. Instead, its design planes intersect, a discreet balcony hides the main entrance and the small garden stands up proud against the grey stone walls. The lights under the helm of dusk in conjunction with the sober plants give a slight touch of mystery to the house, rendering the composition charming and magical. We begin our tour inside the house with the most relaxing of spaces: the games room and bar. As we can see, its style gives it an air of mystery, as if an underground cellar is involved, and we'll soon know why. 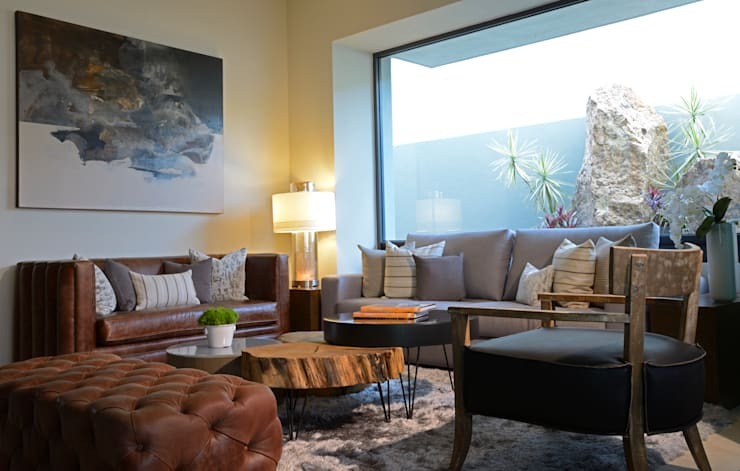 The room has an entertainment area with bar, a games table, a living room and a television to enjoy concerts or sports games while imbibing delicious, refreshing drinks. 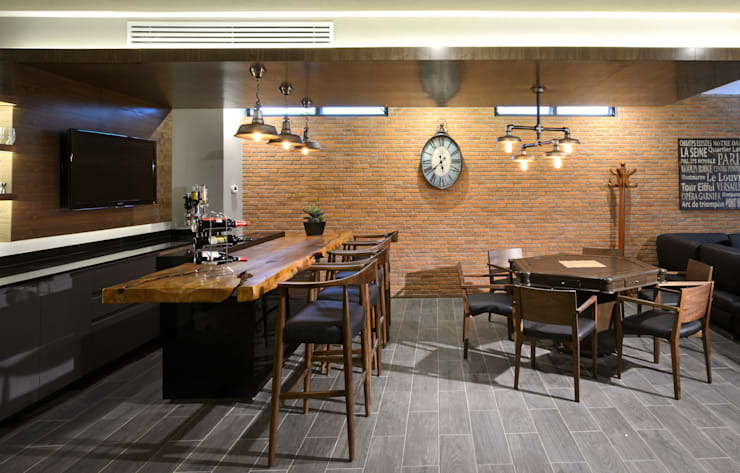 The red brick walls increase the feeling of rusticity, which is complemented by the porcelain tile floor with a wood image finish. The bar consists of a trunk section whose perimeter is shown to be naturally irregular, covering a very modern and sleek black cupboard. An important and striking detail is the lighting: pendant lamps marked in the tone of industrial style give a stylish and tasteful finish. Now we get to the reason why the game room and bar looked mysterious and underground: the house has a wine cellar, and the environmental design was made specially to create the ideal atmosphere. How wonderful! 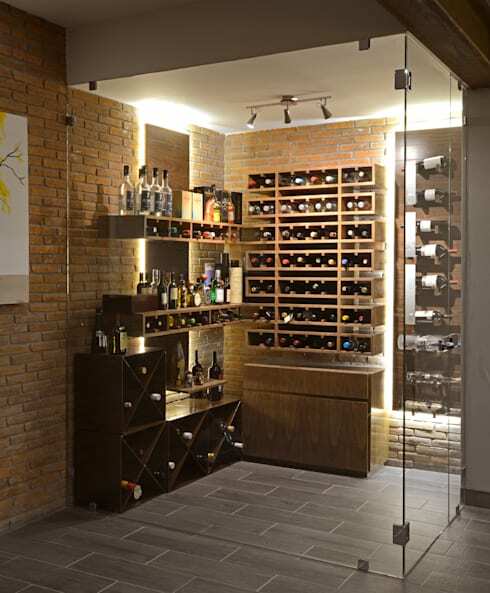 Taking up a corner of the room that houses the bar, this is the perfect alcove for any wine connoisseur. With comfortable chairs and good music, anyone will feel welcome here and spend many an evening relaxing and unwinding. Following the cosiest areas of the house, we have this family room, where casual feeling does not detract from its elegance. A modern coffee table is clearly the star of the scene, with its delicate texture and natural trunk with flat pieces of grey granite, supported on a simple and modern design. A leather sofa, chair of tempered wood and ottoman of soft brown leather, together with a linear sofa in modern design create an atmosphere of eclectic style where every element, every detail and every part of the whole merges with the rest harmoniously. The social area of the house provides a space where the kitchen and dining room are integrated in the same environment. The kitchen is in a modern style, particularly thanks to the L - shaped layout with a central island, which serves as a breakfast bar, and the pantry. In this linear design high cabinets, which are white and bright with a shiny texture and with thin stainless steel handles, grab our attention. The bottom of the cupboards was coated with a finish that simulates light wood, breaking with monochrome without altering the pure and clear cut of the place. In the dining room they opted for a set of furniture in grey. 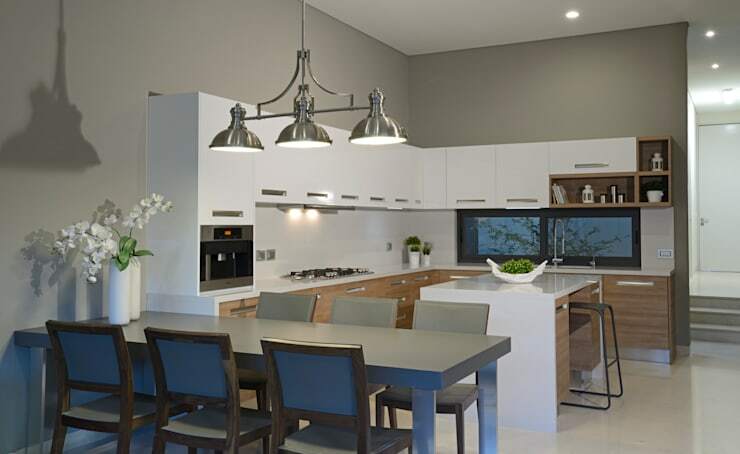 This option is simple and therefore, modern, elegant, and practical to combine perfectly with the white surroundings and the walls painted a subtle grey colour. In the social area we find the main room, a soberer space that does not, however, lose its casual character and comfortable style. 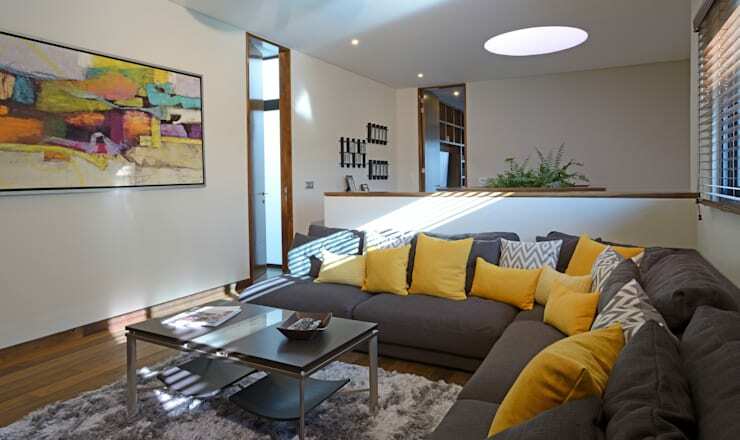 A large L-shaped couch in grey is situated on an equally grey rug, which focuses the attention of visitors here with its yellow cushions and highlights. This is an attractive feature amid the white and bright room. Do not forget the art on the walls, because it is often an element of melting colours, textures and shapes found in the overall design. 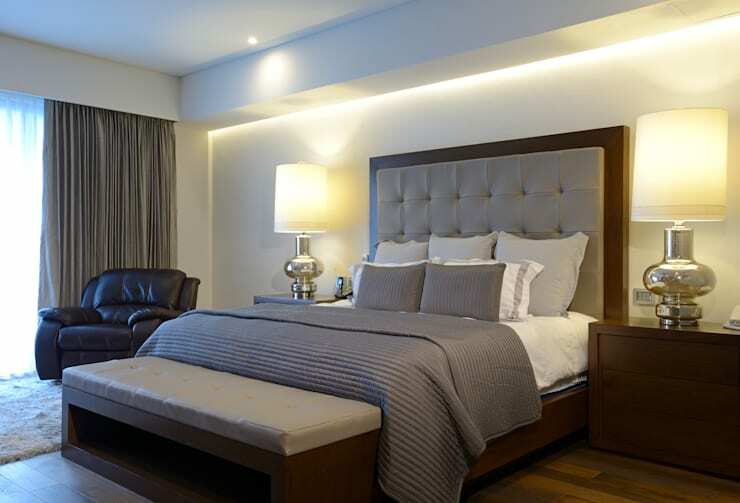 The master bedroom is an elegant and comfortable space. The grey background acts up and, along with white, creates elegant and comfortable environment. Wooden touches in the floor and furniture enhance this feeling of comfort and elegance, as the beautiful mahogany colour has the characteristic look of elegance. The linen and textiles also follow the colour scheme, while two elegant lamps large crown the sleeping space with great splendour. 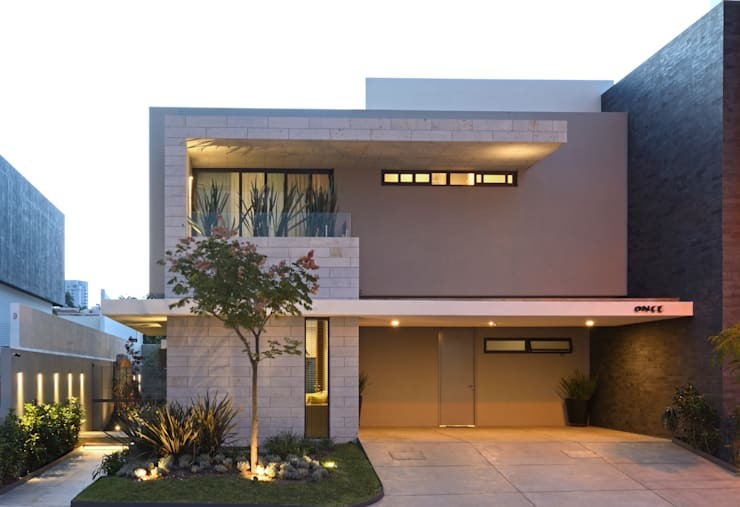 For another spectacular home, take a look at: This Mexican beauty! Which was your favourite room in this Mexican home?